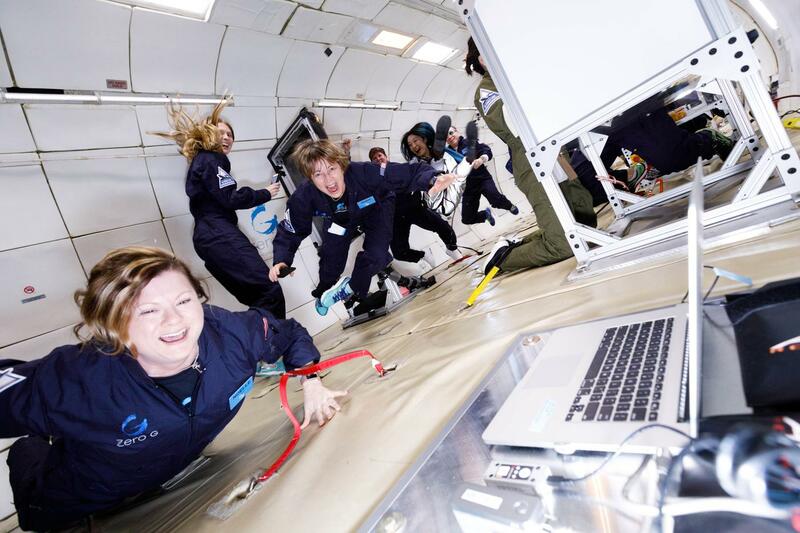 On November 17, 20 researchers from the MIT Media Lab Space Exploration Initiative and MIT’s Department of Earth, Atmospheric and Planetary Sciences (EAPS) boarded a zero gravity flight in Sanford, Florida. 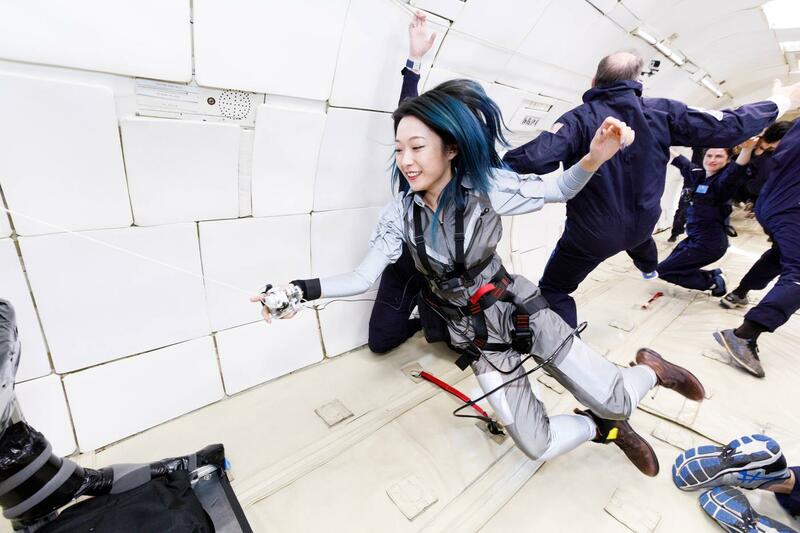 The goal: spend 90 minutes studying the effects of a zero-gravity environment on research ranging from asteroid grappling, to self-assembling space architecture, to music and performance, to sensory and emotional responses. This was the Space Exploration Initiative’s inaugural research deployment, and a first step toward realizing the initiative’s goal of democratizing access to space. Deploying research in zero gravity isn’t a new concept, and this wasn’t the only recent zero-gravity research trip by MIT researchers. But this effort was unusual in many ways—first and foremost the experiments themselves, which represented fields not usually seen as part of space research: design, architecture, art, virtual reality, affective computing, and social robotics. Four of the research projects aboard the flight, representing a wide array of research: (clockwise from left) liquid resin fabrication; performance art with an engineering twist; affective computing and physiology; and DNA sequencing. The projects aboard the flight all represent potentially groundbreaking research; they’ll go on to become peer-reviewed research, models for further iterations, and/or design challenges for others to explore. But the meta goal of this flight speaks to something beyond specific projects and results: it speaks to the broader implications of humanity’s efforts in and around space. The Space Exploration Initiative launched in March 2017 with the Beyond the Cradle event, focused on envisioning, imagining, and building the “new space age”—where everyday people are invited to dream not only about how we will get to space, but what we’ll do when we get there. “Space will be hackable. Space will be playful,” began the call to action for Beyond the Cradle and the mission statement for the Initiative. With this zero-gravity research mission, the hacking and playing have begun in earnest. Zuber and postdoc Noelle Bryan had an EAPS experiment aboard as well, developed with colleague Christopher E. Carr. They were the first group ever to sequence DNA at lunar and Martian gravity, and are now developing a life detection device that they hope to send to Mars one day. The experiment was a great success, reports Bryan, and they’re writing up the results for peer review. Noelle Bryant and Maria Zuber float above their experiment. The zero gravity flight comprised 20 parabolas, with periods of hypergravity on the incline and decline and spans of lunar, Martian, or microgravity over the top of each parabola. Because each zero gravity period only lasted 20-30 seconds, the researchers had only moments to run their experiments. For some this proved a tremendous challenge, while others with more passive projects were able to get a little more playful in the weightless environment. To my right, Xin Liu floated gracefully, feeling out a zero gravity performance-art dance while anchoring herself with Orbit Weaver—a hand-mounted device that shoots out a line and attaches to a surface with a magnet, theoretically allowing her to move with greater control and agency. “Think of me as a space-Spiderman!” she said. To my left, Carson Smuts fiddled frantically with the controls of Spatial Flux, a project intended to rethink the way astronauts anchor themselves. Carson and his research partner, Chrisoula Kapelonis, approach the zero gravity environment as designers: How does architecture change in the context of space? Smuts and Kapelonis wanted to make sure that their zero gravity project was something that would normally fail here on Earth. They chose silicone because it fails under gravity—it caves in on itself. And indeed, in the hangar before the flight, the Spatial Flux prototype looked intriguing, but inert. In zero g it came to life, its purpose fulfilled. Fellow researcher Louis Kang (Synthetic Neurobiology) volunteered to test out Spatial Flux. Toward the nose of the plane, Eric Schilling made a valiant effort to play games designed for zero gravity by Scratch users, ages 8-15. His October 2017 call resulted in over 200 submissions from the Scratch community, from which he chose twelve games from kids in five countries. He recorded his interactions with the games via webcam. “We want to share this as broadly as possible so that educators and kids can see how we all collaborated in a new environment, which might inspire them to new forms of creativity,” says Schilling. Eric Schilling attempts to avoid hitting the colored part of the screen while floating in zero gravity. Ideation was one of the driving forces of this first trip. Each project had to be thoughtfully planned and executed, but the nature of the experiments was so unusual that everyone was just excited to see what would happen—including the flight crew. “Because of the unrestricted funding for this research trip—not coming from one specific biomedical or technological research grant or similar—there’s a lot more freedom. We’re seeing a much greater diversity of experiments than we do on a typical research mission,” said Michelle Peters, research director at Zero Gravity Corporation (ZERO-G). One of our ZERO-G flight coaches agreed: "All of us reviewing the research proposals could see the value of what you’re doing here." So, did the experiments work? Some of them went off without a hitch, others hit bumps (literal and figurative); either result will provide ample opportunity for learning and iterating. "Every time we go anywhere, we learn, we contribute to humanity’s knowledge. All of the students have committed to learning what went right and what went wrong," said Zuber. "This is the beginning of a learning experience. I expect us to do another flight, and for there to be increased sophistication of the ideas and designs." "Trying to design an experiment that’s actually worth doing on a zero gravity flight is nontrivial," said Ito. "Designing an experiment where there are a limited few seconds to actually test the hypothesis is something that people in space fields do a lot. But to have that as a design constraint for the Media Lab, where most students are focusing on fields that have nothing to do with traditional space research—that provides an opportunity for deployment that pushes or even reimagines the boundaries of their work." A huge range of research and a little bit of play in zero gravity. Reimagining boundaries is a specialty of the Media Lab. Many of the students who submitted proposals were inspired by the trip itself to think of their research in entirely new ways. Nicole L’Huillier and Sands Fish created the Telemetron, the first musical instrument designed exclusively to be played in zero gravity. Ani Liu created Smells for Space, a project playing with how scent might help spacefarers stay connected to places and people on Earth. Nikhita Singh and Pedro Reynolds-Cuéllar were the two flyers from a four-person team in the Personal Robots group who designed an experiment with social robot Jibo, to learn how social companion robots could help people with cognitive, creative, and social tasks in space. All of this creativity and out-of-the box thinking smacks of the Media Lab ethos, but it also offers a hint of the limitless possibilities facing humanity once the technology catches up to our desire to explore the cosmos. “With humanity at the cusp of interplanetary civilization, the Space Exploration Initiative is beginning to think beyond technologies strictly for astronaut survival. We can begin to bring our culture into space, and build a vanguard of human culture in space,” Ekblaw said. The prospect of a combined eight minutes of zero gravity inspired these researchers to imagine and create things that have never existed before. What might happen when people working in the arts, in architecture, in affective computing, in social robotics, in neuroscience, have access to that environment full-time? These projects are prototypes for our sci-fi future. Space will be hackable. Space will be playful. Space grows ever more accessible to the space enthusiast.